In the wake of Hurricane Katrina and the devastation that has followed, consumers are feeling the economic consequences of the disaster. Record gasoline prices are constantly in the headlines, which leaves many asking why prices are so high. While supply and demand are the primary determinants of gasoline prices, a significant portion of the price consumers pay at the pump can be attributed to gasoline taxes. In fact, the federal gas tax alone equals 18.4 cents for every gallon purchased (See Figure 1). Source: Congressional Research Service, Tax Foundation. In 1932, the federal government imposed the first federal gas tax. It began as a temporary levy with a rate of just 1 cent per gallon. Over the years, the tax burden has increased significantly. The Revenue Act of 1941 made the federal gas tax permanent and increased the rate to 1.5 cents per gallon to help fund the war effort. A decade later in 1951, the tax was increased to 2 cents per gallon to assist in the funding of the Korean War. After President Eisenhower’s idea of an interstate highway system had been instituted, the federal gas tax was raised to 4 cents per gallon in 1959. As recent as 1981, the federal gas tax remained at 4 cents per gallon. Significant tax increases in 1982, 1990 and 1993 increased the federal gas tax by 14.4 cents per gallon, or 360 percent from 1981 levels. In 1919, Oregon became the first state in the nation to place a tax on gasoline and every state has subsequently adopted this form of taxation. This year, according to the Energy Information Administration the average state gas tax is 20.8 cents per gallon. In addition to statewide taxes, often consumers pay local excise taxes on gasoline purchases (see Figure 2). Source: American Petroleum Institute, Tax Foundation. Today, the combined burden of federal, state and local gas taxes costs American drivers an average of 45.9 cents on every gallon purchased. 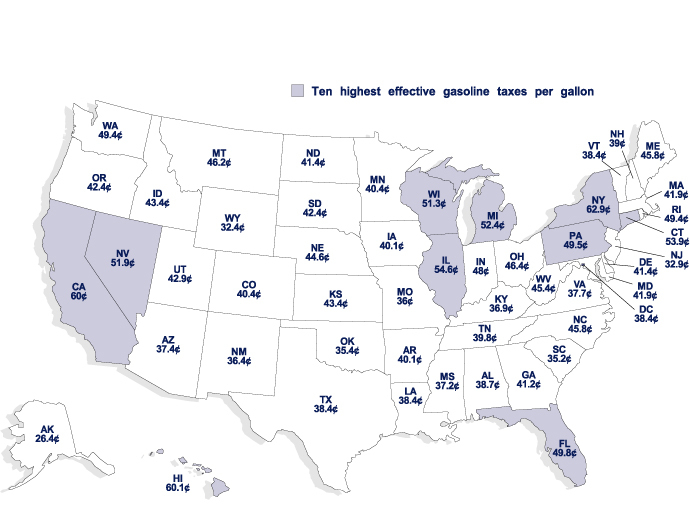 As Figure 2 illustrates, in some states the combined taxes exceed 60 cents for every gallon purchased. According to data on gasoline use from the U.S. Department of Transportation, that amounts to an annual gas tax burden of roughly $271 for every man, woman and child in the United States. In these times of concern over high gas prices, American consumers should remember that gasoline taxes have a significant impact on the amount they spend at the pump.